Viknesh Vijayenthiran November 7, 2010 Comment Now! 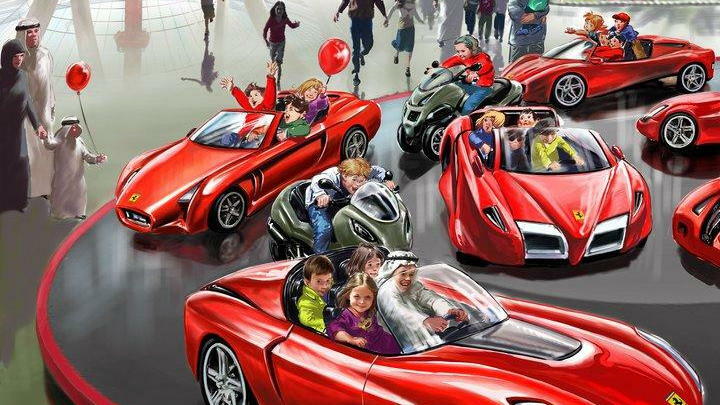 Abu Dhabi is probably tired of Dubai always stealing the thunder as the star of the United Arab Emirates, but that may change with the opening of a new Ferrari-based theme park, which finally opened to the public this past weekend after three years of construction. As you may recall, the opening was originally scheduled for October 28 but had been pushed back to an unannounced date as a sign of mourning for the passing away of Sheik Saqr bin Mohammed Al-Qasimi, Emir of Ras al-Khaimah. 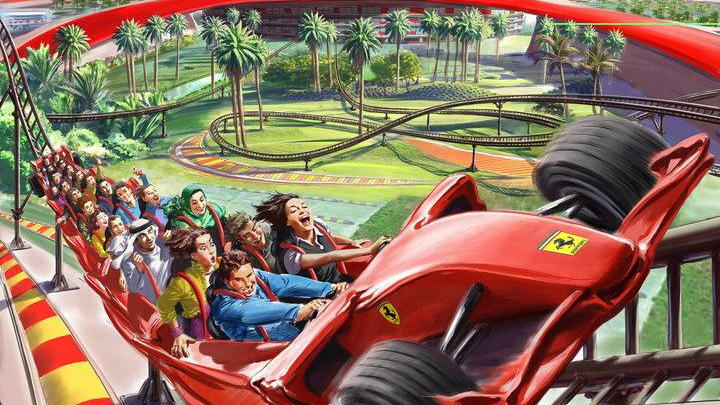 Dubbed Ferrari World Abu Dhabi, the new holiday destination will be the world’s first Ferrari theme park and the largest attraction of its kind. It features an iconic sleek red roof that’s said to be directly inspired by the classic double curve side profile of the Ferrari GT body, spanning 2,152,782 square feet and carrying the largest Ferrari logo ever created. With more than 20 rides and attractions lying beneath it, including the world’s fastest roller coaster, there should be something for people of all ages. Easily the crowning jewel of the park, “Formula Rossa” gives park guests the opportunity to experience 4.8 Gs of acceleration and elevates them to a height of 170 feet before rushing them turns mimicking some of the most famous race tracks on Earth. The F1 inspired ride is so fast, it requires riders to wear goggles for eye protection. Visitors can also experience what it’s like to tour through Ferrari’s Maranello factory aboard the ‘Made in Maranello’ attraction, where they can gain an insight into the making of the actual cars. On top of that there will also be plenty of shops and restaurants to visit. 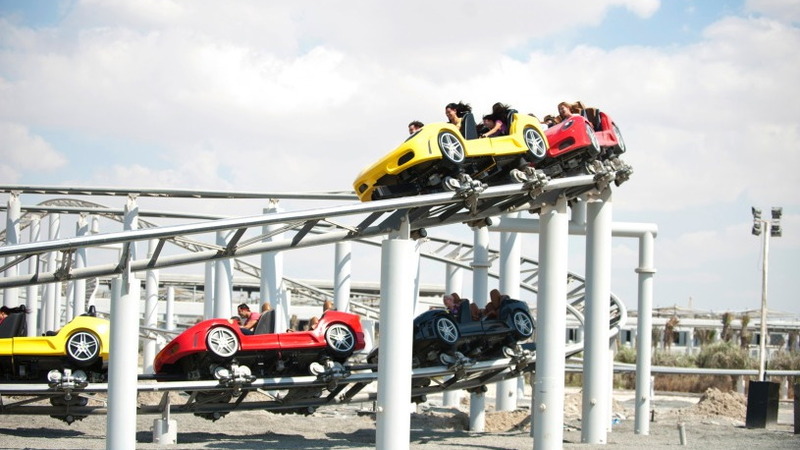 The theme park is located on Yas Island on the North East side of Abu Dhabi’s mainland, which is about a 10 minute drive from Abu Dhabi International Airport and 50 minutes from Yas Marina Circuit where the F1 is held. 1) Formula Rossa - The world's fastest roller coaster, reaching speeds of 150 mph. 2) Speed of Magic - A fantasy 4-D journey following the adventures of a young boy as he travels through a kaleidoscopic dreamscape of natural and phenomenal environments, where no Ferrari has gone before. 3) Made in Maranello - A virtual trip behind the walls of the famous Ferrari factory in Maranello, taking guests through the intricate process of making the world's most sought after car. 4) V12 - An exciting flume ride to the heart of a 12 cylinders engine. 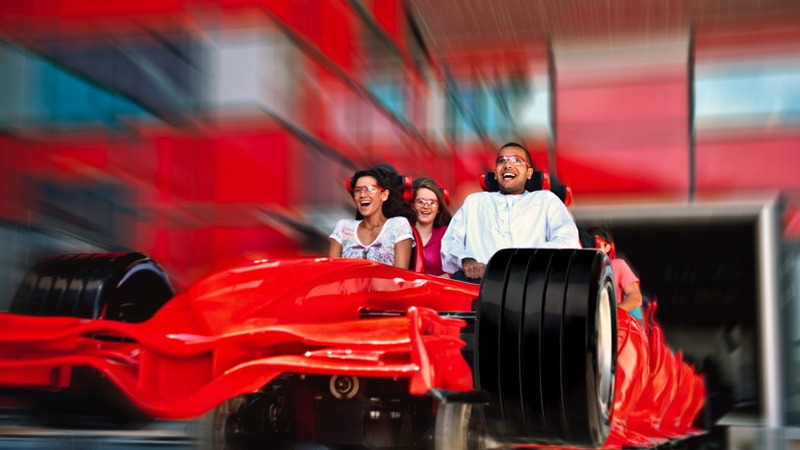 5) G-Force - A thrilling tower ride that will shoot thrill-seekers through the red roof and 62 meters in the air before plummeting back to Earth, experiencing the actual G-force of a Ferrari, in a seat directly inspired by the Ferrari Enzo. 6) Scuderia Challenge - Cutting edge racing simulators similar to those used by the drivers of the Scuderia Ferrari in training. 7) Viaggio in Italia - A virtual aerial voyage over Italy's cities and their main monuments, mountains and coasts pursuing a Ferrari. 8) Fiorano GT Challenge - A unique dueling rollercoaster with Ferrari F430 Spiders twisting and turning through tight corners on a sprint to the finish line. 9) Bell'Italia - A miniature recreation of Italy's most famous locations, from the picturesque Portofino and the Amalfi Coast to Monza racetrack, the Colosseum in Roma, Venezia and Maranello, the heartland and home of Ferrari. 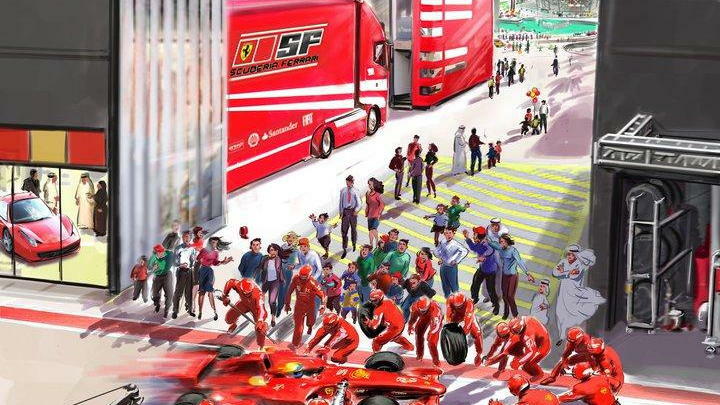 10) Paddock - A re-creation of the Ferrari motor home including garages, transporters & hospitality suites with interactive shows offering fans a taste of the true action behind the scenes on a Grand Prix race day. 11) The Pit Wall - An interactive theatre that allows guests to test their judgment in realistic racing scenarios. 12) Galleria Ferrari - The world's largest Ferrari gallery outside Maranello, showcasing the most exclusive range of classic and contemporary Ferrari's from all over the world. 13) Junior GT - A driving school for children with expert instruction where they will drive reduced scale F430 GT Spiders on an equipped driving course. 14) Junior Grand Prix - After the Junior GT driving experience, budding F1TM drivers can enjoy the race track in scaled down Ferrari F1TM racers. 15) The Racing Legends - A ride through Ferrari's greatest racing moments starting from the first races all the way to today's F1 victories. 17) Cinema Maranello - Ferrari World's own theatre showing ‘Coppa di Sicilia', a short film that tells one of the many inspiring stories from the life of the legendary Enzo Ferrari. 18) Junior Training Camp - An interactive play area for children where they can engage with a waterless car wash, become custom ‘constructors', climb up the grandstand, pilot remote cars, peddle their own miniature Ferrari and play with an F1TM car made of soft, guest-friendly foam. 19) Carousel - Featuring never-before-seen Ferrari prototypes based on winning designs from a Ferrari competition. 20) Dining and Shopping - A range of concept restaurants and cafes offering authentic Italian dining experiences, in addition to unique shopping locations.